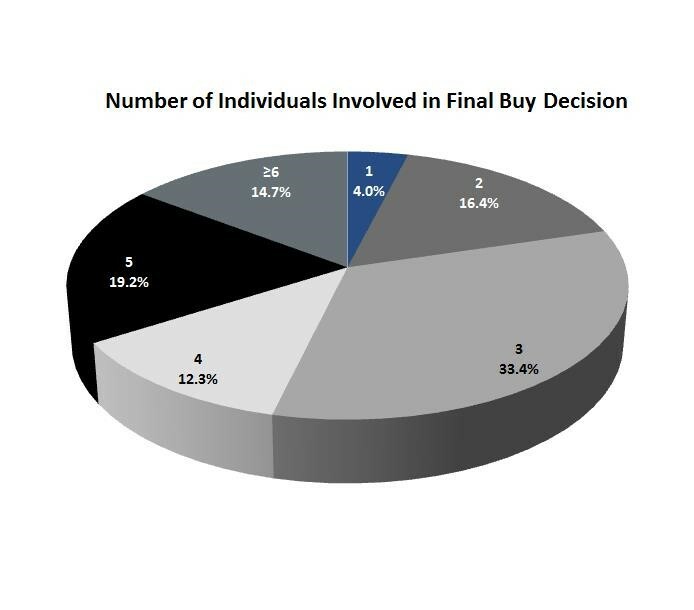 The 2014 Sales Best Practices Study conducted by Miller Heiman was just released with some excellent insights. This study is conducted each fall, and released the following summer, to analyze the behaviors of complex B2B sales organizations and provides insights into the selling and sales management activities that produce the greatest results in the current B2B sales landscape. In part of their executive summary for the 2014 study they make a note regarding sales technology. Strategically, they raise the question, “How will sales organizations capitalize on the rapid advances in sales technologies?” Their response is for the company to develop a comprehensive sales technology strategy. Great question with a well-intended response. However, the only ones to capitalize in this scenario are the CRM vendors implementing the solution. The part of the equation that is overlooked is the sales professional who is in the field everyday with the mission to grow revenue for the company. They view CRM as a stick that measures their effectiveness in evaluating questionable lead sources and their ability to move these opportunities through the selling cycle. Add to this the ability to devote the time required to learn how to update and or add data to the sales automation system. A current CSO Insights study found that sales professionals on average spend 58% of their time on activities other than selling. This percentage has hovered around 60% for several years, and is consistent across studies performed by many organizations. So given these non-selling activities which consume sales professionals’ time, what would you expect their response to be with respect to CRM updates? They are most likely going to “cook” or “spin” the pipeline updates to reflect what the company wants…3 times my annual target by the end of January…which keeps management off their backs and allows them to sell. Reference the post titled, “Good Luck, We’re All Counting On You” at 4dsales.com for more insights into CRM and the extended “sales team”. So then, what truly is the best way to “capitalize” on rapid advances in sales technology? KEEP IT SIMPLE!! Start where your sales team can make the most impact and gather the most pertinent information…in front of customers and prospects. Help your sales team fly the company plane in front of customers and prospects!!!! Provide your sales team with mobile technology that is easy to use in front of clients and that equips them with all the information that consistently and truly represents why they should buy from your company!!! 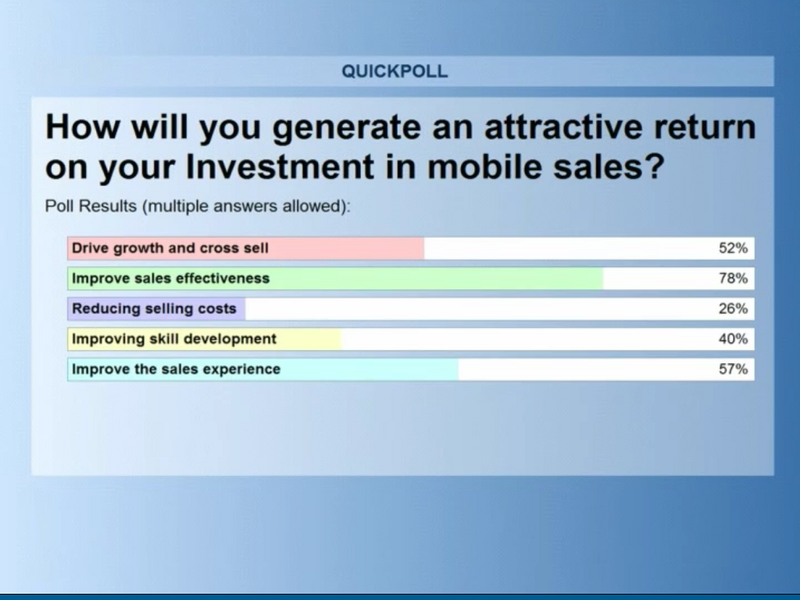 A recent poll conducted by the Sales Management Association before a sales mobility webinar showed that 78% of sales leaders believe improving sales effectiveness would provide the greatest return on investment in mobile sales deployment…or more broadly speaking in sales force automation. They specifically cite reengineering content packaging/delivery as well differentiating the customer engagement experience as providing the greatest return on investment. Combine this with good sales leadership at the first line level to coach the team using the sales tool to support execution of the sales process. You will also be able to gain valuable feedback/analytics from the team on what content best represents the company and its products and solutions. Overall, a sales force automation approach that truly allows you to capitalize on the advances in sales technologies. Starting the sales technology strategy at a point where a large portion of your revenue is generated, in front of customers and prospects, will quickly equate to a solid return on the investment by increasing your sales team’s effectiveness. You can also gain valuable insights through analytics from your sales team to refine and improve your “Why do customers buy from us” message which in turn leads to targeting the right opportunities representing companies which are most likely to buy from you to fill your CRM pipeline. What a wonderful world it could be!!!! Investing in tablets for your sales force is now more justifiable than ever, thanks to sales productivity tools. 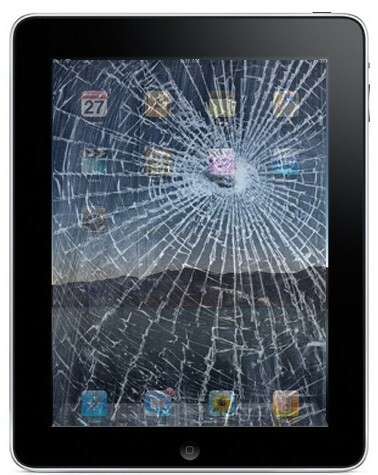 While tablet sales have grown to 195 million in 2013 from 116 million in 2012, the costs to deploy them are dropping. Now we are learning that the total cost of ownership for tablets, which includes hardware, basic software suites, and services, is between $100-$120 per month. Smartphone expenses are often greater than tablets if you take the $100-$120 per month number, and tablets are now 50% less expensive to own and operate than PCs. The justification for tablets becomes even easier with the help of sales productivity apps. A recent study by Pace Productivity illuminates how sales people spend most of their time in an average 49 hour work week. The chart to the right is from the study and shows the breakdown of hours. If you are in sales, sales management, a president, or owner of a company, you need to be aware of this study. According to the findings, planning and administrative tasks consume 33% of salespeople’s time. The time actually spent selling only equates to 22% of daily activity. So odds are, your salespeople are spending less than a quarter of their time getting to do what you are actually paying them to do. If you can move the needle up on that statistic, you stand to gain not just cost savings, but enhance revenue generation. 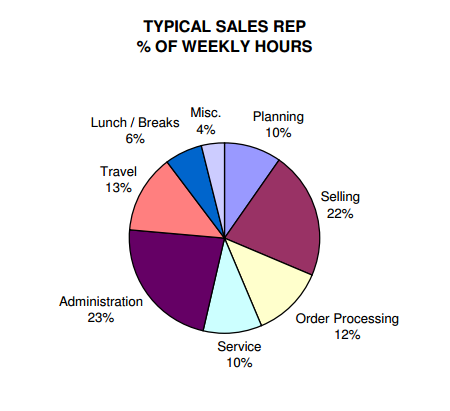 On average a salesperson spends 776.16 hours per year on administrative duties and only 517.6 hours per year selling. If you could provide your sales team with a tool that helps them reduce the amount of time they spend on these administrative activities by 10 percentage points, you could shift that time over to direct selling activities. That sounds almost impossible on the surface until you realize these administrative activities include time spent in marketing and presentation preparation. Some other studies we’ve seen point to as many as 7 hours per week spent just preparing sale material. That’s basically a day a week. What if you could put materials in the hands of your sales team in a manner which made the information easy to find, easy to arrange, and easy to present? You would likely shift a lot of that lost administrative time into time spent selling instead of hunting for information. If you could shift 10 percentage point from admin to selling, what impact would it have on revenue and on margin contribution? In this scenario, 32% of the time would be spent in front of customers and prospects. The salesman would gain 236 hours of more productive time. That means you have the potential to dramatically increase revenue by leveraging a tool to shift time around. In today’s world, increase revenue is a very intriguing way to pay for the tool vs. just reducing cost. 4DSales has spent time researching numerous studies, which when taken collectively show the average number of sales calls needed to close a sale in the B2B environment is 5.12. If each call consumed an hour, 46 more prospects could be managed each year. That doesn’t even take into account that some of these tools can also decrease the number of calls required to close a deal. With the capacity to manage 46 more prospects with only ten percent closing and contributing $1000 gross margin, or $4,600, the company justifies its tablet and sales productivity tools expense in approximately three months. Leveraging sales applications, especially those which reduce the time investment and increase the effectiveness of customer engagement and presentation management, is at center of expertise in our company. If you would like to review your justification scenario with us, please contact us at 918.99.8870 or 4DSales@4DSales.com. Introducing new software into a sales organization can be a challenge. For instance, the recent Merkle Group survey indicated that 63% of CRM implementations were considered failures. Early ERP integrations were almost as disastrous with 51% considered failures. Every organization has met challenges in technology projects, even when introducing PowerPoint, Excel and other familiar software tools. So, what success factors are needed for the smoothest implementation program in your organization? One of the most important things you can do when implementing technology for any role within your organization is to make sure it is actually beneficial to the people who are using it. This seems obvious, but it is frequently missed. Based on my experience using CRM systems as a rep, and implementing them for my sales teams at four different companies, I can tell you the lack of value to the rep plays a huge part in their rejection of CRM systems. We can tell salespeople all day long how much a CRM system will help them, when in fact we all know it is primarily a management tool that helps upper management. They see through this (who wouldn’t) and it gives them another reason to resist and reject the system. Resistance is rooted in the fact the salesperson sees no value in the CRM, and in fact sees it as a detriment because it takes time away from selling and replaces it with perceived “busy work”. Salespeople operate on the precious commodity of time. Time away from sales engagement with prospects and customers has a direct impact on not just company income, but on the sales rep’s personal income. Tools which create more time to create more business and income opportunities are more willingly accepted. Tools which increase the odds and improve the speed of closing pipeline prospects are also more readily embraced. So if you are going to implement software for your sales team, put yourself in their shoes, be honest with yourself, and try to understand what real benefit the solution will bring to the team. Sales people are traditionally non-conformists and are more likely to be independent operators. This characteristic is even more exacerbated when dealing with external sales resources such as agents, resellers, and distributors. When rolling out a new sales solution, especially a mobile one, you need to carefully consider the devices on which it will operate. There are two keys reasons for this. The first reason is one of familiarity. If your company uses iPads in various divisions, but the majority of your resellers use Windows 8 tablets, rolling out an iPad only solution should give you pause. I know iPads are the most used tablets for business. I know that you use them internally. But I also know in this example that your top resellers don’t use them. Honestly it doesn’t matter if you think the iPad is better, if you try to ram an iPad-based solution down your channel’s throat, you will fail, and fail big. The second reason is one of cost. If your channel is alternatively heavily invested in iPad, and you push a Windows 8 solution, you are not only dealing with forcing them to leave a tablet technology that is familiar, but you are also hitting them in the pocket book. A typical Windows 8 tablet costs several hundred to well over a thousand dollars. Multiply that by how many reps your channel supports and you can see the real cost for your channel, or your company, beyond the software itself. Pushing a solution that requires new hardware, operating system or peripherals will limit the acceptance and utilization, sometimes significantly. So if there is a blend of iPad and Windows 8 tablet users in the organizations, look for software that works on both systems. Salespeople hate technology! There, I said it. You were already thinking it. I just blurted it out. OK, so not every salesperson hates technology, but the statement that salespeople hate technology is far more common that you are willing to admit. Combine that with another characteristic of most salespeople and you have a recipe for disaster. What is the other characteristic? Most salespeople are ADD. They might not be clinically diagnosed as such, but they definitely have attention issues. In fact, this is one of the things that make good at selling. They like to do new things every day. They enjoy jumping from one situation to another. That characteristic might not be good for somebody in accounting, but it is a useful trait in sales. So salespeople hate technology, and they don’t like to focus on one thing for an extended period of time. What does that mean for situations where we are introducing new technology? It means the technology needs to be simple and intuitive to use. This is actually another reason most CRM’s fail. It’s because most of those systems are not easy to use. Therefore the salespeople don’t want to mess with them. Here’s what makes this even more challenging. What you think is easy, probably isn’t easy to your sales team. I found this out the hard way when we were first designing 4DSales. I had what I thought was a tremendous interface and a slick solution for any salesperson. I proudly showed it to my partner, and he rained on my parade. He told me it was too difficult. He told me salespeople wouldn’t use it. I was incredibly irritated. And yet…he was right! We took several more months to rework the interface before building the commercial version of the product. Now we get as much positive feedback on the ease of use of our product as we do about it helping reps close more deals. Simply stated: Ease of use is key. What are your experiences implementing technology solutions for salespeople? Do you agree with our short list of success factors? Do you have a better list? We’d like to hear from you regarding your experiences. Sales pipeline management has become complicated, and not always more efficient, with new sales tools and techniques now available. On average, 0.75% (less than 1%) of prospects entering the top of the funnel are converted to customers, according to Forrester Research. The chart below from that study illustrates the problem. The bottom line of a 0.75% conversion ratio means roughly only 1 out of 135 deals that enters the top of the funnel drops out the bottom as a win that can be booked as revenue. Those odds are not too attractive. As sales and marketing professionals how do we address that shortcoming? As you can imagine, there are a myriad of ways this can be addressed. We’ve chosen to focus on the following 5 tips that can help your organization close a higher percentage of those opportunities. Lead generation is usually the responsibility of the marketing department. However, marketing personnel have relatively little contact with prospects and customers. The field and inbound sales organizations are in the trenches every day managing objections and competitive pressures. These experiences, if not communicated to marketing, can lead to attracting the least desirable prospects from the next campaign or event. We are all familiar with the technical concept of Garbage In/Garbage Out. If we want to convert more of the leads, a great place to start is with better leads. The alignment of sales and marketing departments can create the desired results of quality leads, along with a larger pipeline and shortened sales cycles. The reason is simple. Working together sales and marketing stand a better chance of getting the right kind of leads in the funnel. And “the right kind” of leads stand a better chance of getting closed, and getting closed in a shorter amount of time. Public information on leads in the pipeline has become abundant. Profiling the prospect can now take minutes on the Internet. Sales professionals and marketing personnel should review as many social media accounts as possible for prospective clients. Twitter, LinkedIn, Facebook, Google+ and other social sites expose valuable information on the prospective company and even individuals in the buying decision making . Public filings in SEC.gov and research information within Hoovers.com are also proven destinations for research. Many larger public companies make it easy to do research. They typically have an investors section on their website that not only contains general information on the company, but also links to their financial filings which can be quite enlightening. Take the time review 10K’s and similar documents to see what’s going on with the company. Finally, if a smaller private company is the prospect, Crunchbase.com is aggregating significant profiles. Profiling prospective customers provides a solid foundation for tailoring your offerings to meet the specific needs of the prospective customer, and that in turn enhances the chances your interaction with them will be much more meaningful. A quality lead can quickly go to waste. According to B2B Marketing Directions, one of the most basic requirements for maximizing results from lead generation efforts is responding to new lead inquiries in a timely fashion. Unfortunately, it’s clear that most companies don’t respond nearly fast enough to inquiries from new leads. The odds of contacting a lead are 100 times greater when the initial contact attempt is made within 5 minutes vs. 30 minutes after the inquiry is submitted. The odds of qualifying a lead are 21 times greater when the initial contact attempt is made within 5 minutes vs. 30 minutes after the inquiry is submitted. Virtually every sales professional knows that time kills deals. Given the information above, it is apparent that time kills leads as well. According to CSO Insights, sales training programs suggested that the way to selling success was to focus on the economic decision maker, aka that key individual who could make a deal happen. A paradigm shift happened during the last economic downturn; that single person seems to have disappeared, as seen in the following chart from the 2013 SPO study. One thing this chart shows is that we have to be reaching out to more people than ever before to influence all the right decision makers and influencers. Influencing 1 or 2 people is now only appropriate for meager 1 out of 5 opportunities. We have to be working with more than just a couple of people if we are going to close the other 80% of opportunities. Telling a story – Your audience isn’t going to remember all of the words you throw at them, but they will remember an engaging story. Get the prospect or customer engaged by sharing a common experience as a starting point and painting a visual image. Surely your prospect has a business problem which your product or service addresses or you wouldn’t be in business. So start by telling them what your company experienced to prompt you to develop the solution you are selling. This approach draws them in, and also builds credibility that you truly understand their problem, because you experienced the same problem and were so frustrated you built a company around a solution. The concept of telling a story is now widely accepted in marketing, and needs to be much more widely accepted in the sales profession. Embracing video – We all know the saying that a picture is worth a thousand words. If that’s true, how many words is a video worth? Videos can be extremely high impact. Do you have a complex service that is hard to describe with words or even pictures. Make a video that shows your service in action. This video by the pipeline service company TD Williamson is a great example of an animated video that was made to demonstrate the complex process of tapping into an active pipeline. This is hard to describe with words or still images, but becomes clear to even those of us not in the pipeline business when you see it in action using this video. Customer testimonial videos are another great example. Your prospect gets to hear directly from your existing customer base why your company, product, or service is so great. These videos are much more impactful that even a written case study with quotes, because they become real. And they don’t have to be “produced”. Taking a quick video of your customer on a job site can be even more effective at times. The key to videos used in a sales process are to keep them short and impactful. Nobody wants to dim the lights and watch a 30 minute video or even a 10 minute video. Using video snippets that are a minute or less can really enhance your presentation, while a lengthy video can actually hurt your cause. Using media appropriately – Many of us became exasperated by wordy PowerPoint slides and decided we would make a change. The problem is that most of us simply made the change of putting some sort of graphic or picture on that same wordy PowerPoint slide. That isn’t using visuals properly. Different types of content and media should be used when visual selling. Leverage videos, images of emails or hardcopy letters singing the praises of your company, or even active websites that show tweets or reviews of your product or service. Depending on your service or product, simple before and after pictures can even be incredibly compelling. You’re telling a story visually, so make use of a variety of different content types to keep your audience interested and engaged. What are some of your tips for closing more deals? Let us know by commenting on this post or hit us up on Twitter @4DSales. Are Printed Collateral Expenses Holding Back Your Migration to More Beneficial Digital Sales Methods? Digital sales methods continue to provide more benefit than printed sales collateral, in cost, efficiency and effectiveness. We have updated analysis in both mediums with the latest market data, in hard costs and soft costs, for your review and audit. What Are the Hard Costs of Printed Sales Collateral? Hard costs of printed material span from labor, to printing and postage. Trying to keep consistency in these costs, we have factored the costs in quantities of 500, unless noted otherwise. Layout and design – Professionals employed in this field have a median salary of $45,000 per year or $20 to $70 per hour for freelancers. Writing – Those with literary expertise have a median salary of $56,000 per year and outsourced talent is slightly higher than designers. Printing – Low cost, do-it-yourself tri-fold color brochures average 30 cents. Presentation folders are priced at 94 cents. A standard flyer starts at 65 cents. Letterhead is a necessity which should be budgeted at 40 cents per sheet. Small #10 envelopes are an additional 30 cents each. If you are selling with catalogs, printing costs will start at $2 each for orders of 500 or more. Postage – Stamps have climbed to 49 cents for a standard letter and if you need to ship a larger envelope, a first class mail parcel costs near $2 for local distribution. What Are the Soft Costs of Printed Sales Collateral? Processing requests from the sales department can be a sizable hidden cost according to P1nnacle.com. Suppose that your company has 150 outside salespeople and that, on average, each salesperson submits one request for collateral documents per week. This means that you are processing and fulfilling about 7,800 requests per year (150 requests per week X 52 weeks per year = 7,800 requests per year). Average request processing time – Assume that the average request requires 20 minutes to process and fulfill. This means that you are devoting about 2,600 hours per year to processing and fulfilling requests (20 minutes per request X 7,800 requests = 156,000 minutes per year) (156,000 minutes per year / 60 = 2,600 hours per year). Hourly processing labor costs – Suppose that the average base wages of the employees involved in processing and fulfilling collateral requests is $45,000 per year. To get an accurate picture of total labor costs, you’ll need to consider other labor-related costs such as payroll taxes and employee benefits. If these costs amount to 20 percent of base wages, then the “all-inclusive” labor costs would be $54,000 per year ($45,000 X 1.2 = $54,000). Assuming that employees work 2,000 hours per year, the hourly labor cost would be $27 ($54,000 per year / 2,000 hours per year = $27 per hour). Annual request processing cost – Using these example numbers, your total annual labor cost of processing and fulfilling requests for marketing collateral documents is $70,200 (2,600 hours per year X $27 per hour = $70,200). What Are the Hard and Soft Costs of Digital Collateral? Hard Costs – With digital collateral, design and writing costs are consistent with printing collateral. Printing costs are reduced to printing materials only when needed on calls. Processing costs are eliminated. In fact many prospects and customers prefer electronic format and this can completely eliminate printing, sending and related expenses. 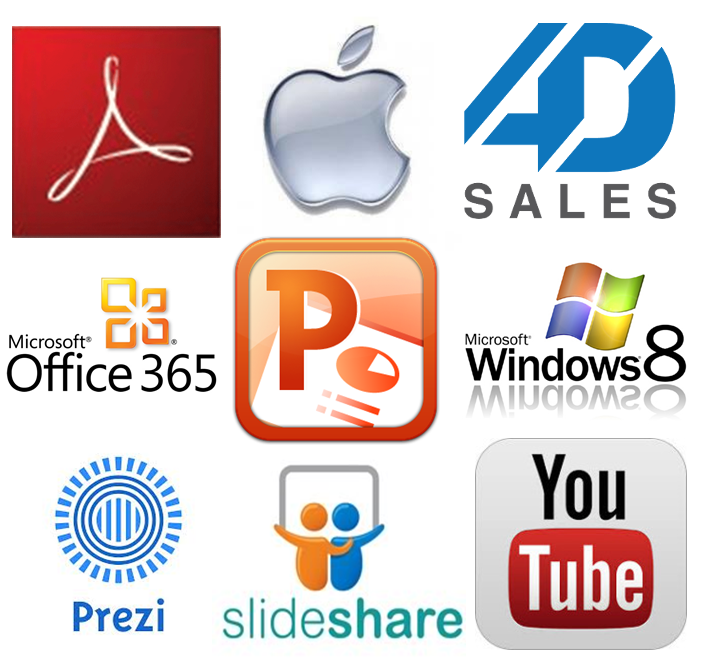 Soft Costs – Presentation software in the form of PowerPoint or Adobe are standard software offerings on low cost tablet computers. Microsoft Office for Windows 8 and iPad is priced at $100 per year while many versions of the Adobe viewer are available for free. Visual selling applications (www.4dsales.com), which create dynamic and high impact presentations from PowerPoint, PDFs, videos and all other digital content are available at affordable rates. Avoid Obsolescence – Printed materials become obsolete very quickly. Digital collateral can be easily edited and distributed by the marketing department or in the field by sales professionals. Multi-Use – Digital collateral can be used as a presentation, a kiosk at a trade show, a tablet in a coffee shop, a website, or be viewed on a smartphone. Distribution – Once produced, digital content can be distributed to social networks and email, connecting your brand with vast audiences. Responsiveness – Viewing digital sales materials on websites and email leaves analytical information which adds to responsiveness. Also, after a sales call, the salesperson can immediately email customized content to the participants with current visual selling tools.